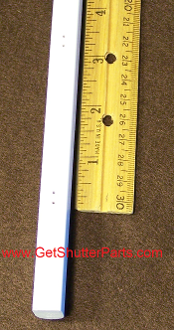 The measurements of the rod are 5/8" X 1/2" X 36" long. This rod will accommodate shutters with a 3 inch staple spacing. This control rod is made from a synthetic material and is currently an off white color. The rod can be cut down to a shorter length or primed and painted, by you, to match your existing shutters. (12) Shutter Staples 1/4" Crown X 5/8" are included to attach the new control rod to your louvers.